When it comes to whiskey terms, how would you honestly rate your knowledge? Do you see yourself as someone well-versed with the majority of whiskey terms or whiskey-related words? Exert some effort and learn a few whiskey terms; it will help prove your fondness for this fire-water! You don’t need to master them, but learning a few whiskey terms now will help you claim your spot among the whiskey aficionados. Learn a few more, and you can be the authority when it comes to whiskey terms. Here are a few whiskey key terms for starters, followed by little tidbits of info worth sharing. Are you familiar with any of these whiskey terms? Cask finish refers to the transfer of maturing whiskey from its first cask to its second cask. This technique gives the whiskey a more distinct flavor. It is a time-consuming process which may take anywhere from a couple of weeks to several months. Cask finishing is essential in producing a high-grade whiskey because it helps you to get a desired, stronger flavor. This aspect of producing whiskey, though, is a very touchy subject. It is because even our scientists are clueless about it. They see this side of whiskey-making as a gray area because they can’t figure out the exact chemical changes that whiskey goes through in an oak barrel. There aren’t any specific rules to follow, but everything about this whiskey term is a matter of experimentation and trial and error. Charring is the process of scorching the inner lining of a barrel with an actual fire. This process will open up pores and fibers of the inner wood of the barrel and render the whiskey to extract flavors from the wood. Additionally, charring catalyzes the significant chemical changes that are vital to the liquor. If casks are not heat-treated first before use, the resulting whiskey will have a sappy taste. For about a minute or less, the interior of the barrel gets treated with fire which results in charring. Every distiller has the liberty to choose the degree of “doneness” that his cask should have with respect to the cooperage’s scale. It also depends upon the amount of time that the cooper allows the flames to burn, which is mainly dictated by the type of liquor that goes in it – for example, for bourbon whiskey, it is about 40-60 seconds, with a maximum time of 3 minutes of charring. The various degree of charring of a barrel’s interior lining will have an impact on the chemical compounds it will hold. Tannins, lactones, vanillins, and wood sugars can get caramelized depending upon the amount of time and level of char you subject the interior of the barrel to. As for the carbon component of the char, it will eventually help remove the sulfur compounds found in the spirit. Chill filtration is the process of removing fatty acids and esters, from whiskey. An ester is a compound that can form during fermentation. It is essential to take these substances out because they can cause the whiskey to have a cloudy appearance when whiskey is resting at room temperature. In addition to that, they can also cause the formation of unsightly sediments at the bottom of the whiskey bottle. To start with, you can carry out the chill filtration process by reducing the temperature to zero degree Celsius. After that, you will need to strain the liquor using a very fine filter. Whiskeys with an ABV rating below 46% need to undergo chill filtration because they have a substantial amount of esters. These substances do have an impact on the final taste – on the mouthfeel of whiskey. Each has its distinct flavor – so much so that if you don’t take them out, the whiskey’s quality, taste and mouthfeel can be compromised or severely affected. According to “Guide to Chill-Filtration” from Bruichladdich Distillery, whiskey has a minimum of 100 flavor compounds. They can all contribute to the mouthfeel, aroma, and taste of whiskey – but chill filtration saves the day by removing them all! When an alcoholic beverage undergoes fermentation, it produces impurities we refer to as congeners. These particulates influence the aroma, the taste, and the color of whiskey. We can’t tell if they are responsible for hangovers nor the severity of symptoms, as there has been no solid proof. Whiskey is a qualified “top shelf” bottle. It means to say that they have fewer impurities compared to other liquors, especially those that are in plastic containers. The rigorous distillation process that whiskey goes through, gives it the higher price tag. These are the establishments or places where the production of oak barrels take place. Workers here craft the barrels to perfection so they can contain and hold liquid. A person who works in a cooperage is a cooper. Their primary function is to make barrels or casks. ABV or alcohol by volume measures the percentage of ethanol content in a drink. Alcohol by Volume ratio is the accepted standard by which we measure the alcohol content of any given alcoholic beverage. If you recently purchased a bottle of liquor, you may check this out from its product label as “alc/vol”. It will give you an idea if a drink is going to intoxicate you in no time! In France, they call this as degrees Gay-Lussac, after a French chemist Joseph Louis Gay-Lussac. This one’s not just one of those whiskey terms as there are a plethora of alcoholic beverages everywhere! Alcohol by volume on the label. The varying levels of alcohol in different beverages can give us some clue on the process which all rely on one single thing, fermentation. Fermentation is a process by which the yeast transforms the sugar components into alcohol. Thus, between wine and beer, wine would take longer to ferment because of its sugar content. Maturation of whiskey deals with placing it inside an oak cask and allowing it to soak up the essences from the cask. In Scotland, the aging of Scotch whiskey takes at least three years. For as long as your whiskey remains inside a cask, the taste and mouth-feel will continue to improve, that is for sure. There really is no rule or a timetable to follow. The length of time you mature a whiskey is a matter of personal choice and preference. The moment you transfer whiskey to a bottle, there is nothing else you can do to enhance its taste. Now that’s a whiskey term that proves one can get better with age! Whiskey maturing in large casks. Compared to whiskeys aged in new barrels, the maturation time for Scotch whiskeys requires a longer time to complete. It is because they do it in second-hand oak barrels. Furthermore, compared to other whiskey distilling countries where humidity and temperature levels are higher, maturation time for Scotch whiskey is longer in Scotland because of their colder climate. “Why do whiskey distillers prefer the use of oak barrels?” You’d often hear this question from people who do not know how significant oak wood is in aging whiskey. The reason why oak is the wood of choice is due to its physical and chemical attributes. Compared to other types of wood, oak is more durable. It’s full radial rays help it keep its strength when formed into a barrel. In contrast to pine or a rubber tree, we classify oak wood as a pure type of wood. It means that oak wood has resin canals that give off strong flavors which the liquor then absorbs and become part of its character. Another factor why oak is the wood of choice among distillers is because of the desirable results from the oak lactones produced after the heating treatments during the coopering process. Each distillery company has their master blender. He takes charge of overseeing whiskey production, the blending of whiskey for a more desirable product. He makes crucial decisions on what goes in a blended spirit and usually works with a team of apprentices. These apprentices eventually become ripe with skills and expertise so much so that they also become master blenders themselves. A highly skilled master blender usually works for a distilling company for a very long time. I bet you he knows all the whiskey terms if he didn’t write “The Definitive Guide to Whiskey Terms”! Nosing doesn’t have anything to do with people who seem to always want to get in your business! It is a whiskey term that describes perfectly the act of sniffing whiskey. Sad to say that many people are not aware that sniffing will help you to have a more enjoyable whiskey experience. In order for you to pick out the aromas and flavors of whiskey, sipping alone is not enough. Getting a good smell of your whiskey will help activate your palate so your senses can experience its distinct taste. 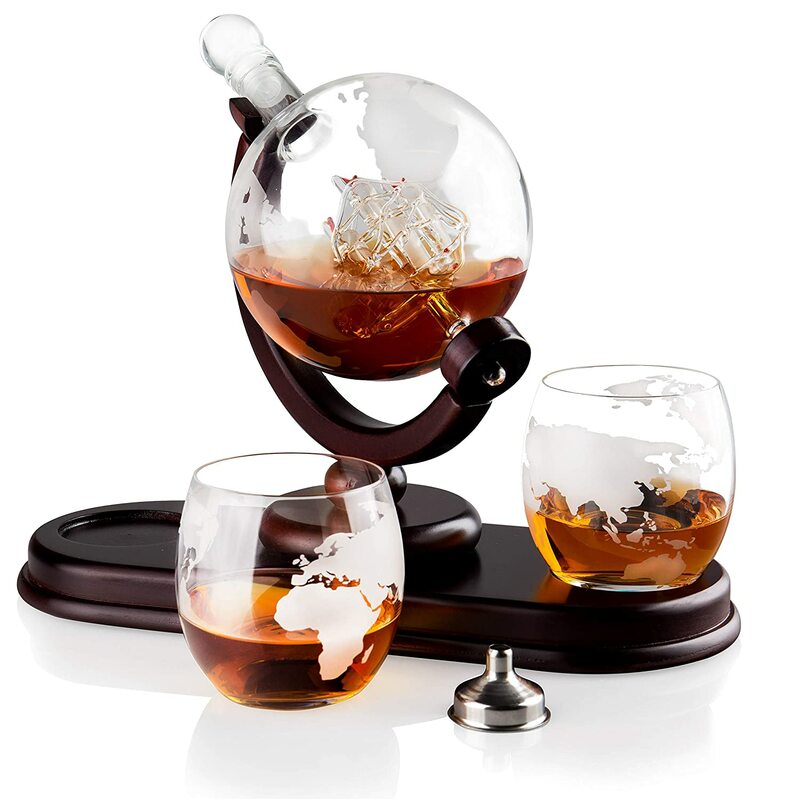 Whiskey aficionados see this measure as a good way to enjoy this type of drink. If you know nothing about liquors, you will qualify this as one among a few whiskey terms considered as jargon. While it suggests a weird religious undertone, angel’s share is actually the amount of liquid lost through evaporation during maturation. While we mature whiskey in oak barrels, a small percentage of this liquid will be lost. The amount of this lost liquid yearly will be around 1% of the original volume. There are a few reasons that attempt to explain why we lose this small percentage of liquid when aging whiskey. It could be due to the age of the spirit. Sometimes the climate in contributes to this, too. Or it could also be due to the size of the cask. When you say cask strength, this whiskey term has something to do with any additional processes or dilutions that whiskey could go through after its maturation. For instance, to make each batch of whiskey uniform before they’re bottled up, you may need to bring them down to a specific proof or level of alcohol by volume – an extra process. So, when referring to cask strength, it is the original strength of the whiskey right after drawing it from the cask. How does cask strength affect the flavor of your whiskey? An adequately matured whiskey usually comes with a delicious punch. While aging, the whiskey develops or forms a symbiotic relationship with its oak cask. The maturing whiskey seeps into the wood grain while allowing the oak flavors to infuse the spirit slowly. It is at this stage or time that the robust and intense flavors – the hallmark features of a cask strength whiskey – come into play. Here’s one of several whiskey terms you probably remember from your science subjects, after all, whiskey making is a science! (Alright, it is an art as well!) Distillation is a process that separates a liquid from another type of liquid. If your objective is to purify an organic compound, distillation is the best scientific process to use. It works best when the fluids have varying levels of boiling points. When you heat an organic mixture to a certain level, the liquids will separate. Hence, ethanol separates from water through the process of distillation. Ethanol is the type of alcohol found in an alcoholic beverage. It also explains the reason why rum or arrack, and whiskey are also referred to as distilled spirits or distilled liquor. You can obtain these alcoholic beverages by distillation from a fermented fruit juice, wine, or from grains. Over the course of many years, people have debated how to spell it right. The Scots would jot this word down as “whisky”. As for the Irish, they will write or spell it as “whiskey”, with an “e”. To identify the cause of this difference in spelling, we need to trace its historical background. The difference in how the word is spelled out has something to do with how the word translates into its Irish Gaelic and Scottish forms. Additionally, the word “whiskey” with that extra “e” on it also refers to the American whiskeys. When Irish immigrants came to the US in the 1700s, somehow that extra “e” got in there. The word whiskey has been spelled this way ever since. So, the only time that you would spell it as “whiskey” is when you are in the US and Ireland. If you happen to be in other parts of the world such as Japan, Canada, Scotland, Australia, and parts of Europe, the proper way to spell it would be without the extra letter “e”, whisky. Pot still is a type of distillation apparatus, and we primarily use them when trying to distill alcoholic spirits like cognac and whiskey. If Coffey distillation process operates on a continuous basis, it’s the other way around for a pot still distillation. In a pot still, distillation works on a batch basis. Tradition has it that a pot still made from copper is the best to use. However, they come in a variety of forms and shapes, depending upon the style and quantity of spirit you desire to produce. Did you know that according to Irish law, only a pot still could be used for the distillation of whiskey, cognac, Scotch and Irish whiskeys? During the initial stage of distillation, about two-thirds of the pot still should be filled with a fully fermented wash or liquid. Usually, the liquid has an alcohol content of about 7-12%. In distilling whiskey, the liquid base frequently used is beer whereas in brandy it is a wine base The still pot will be heated to bring the liquid to its boiling point. Did you have fun learning these whiskey terms? Stay tuned for future posts about more whiskey terms you can master!